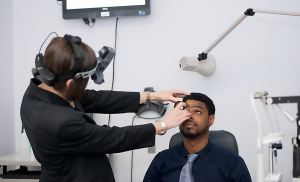 Looking For Eye Care & Eye Exams Near You, in Ellicott City? We don't just provide comprehensive eye exams, we offer expertise in customer care, eye health, and a professional atmosphere. Professional Vision of Ellicott City has been performing eye exams for adults and children with the latest technology, and our exceptional doctors specialize in vision over 40, treating a range of conditions and help manage eye diseases like glaucoma, diabetic retinopathy, dry eye, cataracts and macular degeneration. Corneal Refractive Therapy is a special non-surgical vision correction procedure in which your cornea is reshaped as you sleep by specially designed gas permeable contact lenses.